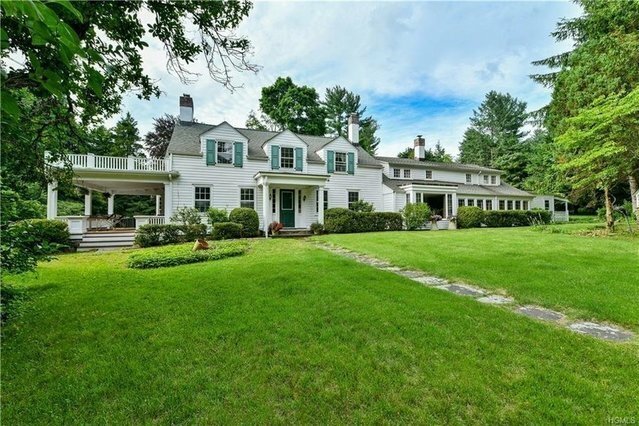 This impressive, 7600 square foot home began as a small farmhouse in 1765. Grand-scale additions over the following 150+ years led to its current historic prominence, with approximately 75% of the home constructed and refined in the first half of the 20th century. The home boasts 7 bdrms, 6 bathrooms, 3 staircases, grandly scaled rooms, 8 fireplaces and historical details such as a spectacular leaded glass ceiling and richly paneled library with hidden shelves and door installed during the Prohibition(pointing to its alleged speakeasy past). The oldest section of the home showcases original and hand hewn, exposed oak beams and a brick cooking fireplace and old floor boards measuring up tp a foot or more in width. The lush level property is secluded and accessed by a curved double entry driveway. The sparkling pool and pool house are perfect to relax and enjoy the setting. 2-car detached garage and shed are located across from the stone courtyard. A classic home lover's delight!